[82 Pages Report] Driven by the increasing usage of swarm intelligence for solving big data problems, the rising adoption of swarm-based drones in the military, and need for swarm intelligence in the transportation business, the swarm intelligence market is likely to witness high growth in the coming years. 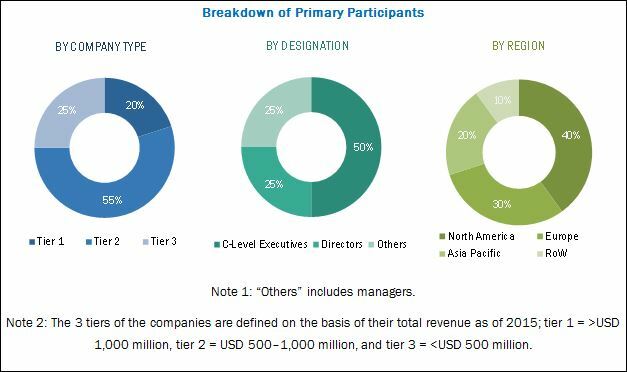 The swarm intelligence market is expected to be valued at USD 447.2 Million by 2030, growing at a CAGR of 40.47% from 2020 to 2030, considering the technology will get commercialized by 2020. The estimated year considered for the study is 2020, and the forecast period is between 2020 and 2023. The objective of the report is to provide a detailed analysis of the swarm intelligence market based on model, capability, application, and region. The report provides detailed information regarding the major factors influencing the growth of the swarm intelligence market. The research methodology used to estimate and forecast the swarm intelligence market begins with obtaining data through secondary research, such as the Journal of Swarm Intelligence and Evolutionary Computation, newsletters, and white papers of leading players in this market. The top-down approach has been used to estimate the overall size of the swarm intelligence market. In the top-down approach, the overall market size has been used to estimate the size of the individual markets (mentioned in the market segmentation) through percentage splits from secondary and primary research. For the calculation of specific market segments, the most appropriate parent market size has been used to implement the top-down approach. Players involved in the swarm intelligence market are DoBots (Netherlands), Hydromea (Switzerland), Sentien Robotics (US), Unanimous A.I. (US), AxonAI (US), Swarm Technology (US), SSI Schäfer - Fritz Schäfer (Germany), Valutico (Austria), Enswarm (UK), and Power-Blox (Switzerland). This study answers several questions for the stakeholders, primarily which market segments to focus on in the next 2–5 years for prioritizing efforts and investments. This research report categorizes the overall swarm intelligence market based on model, capability, application, and geography. Further breakdown of different regions under geography on the basis of applications. 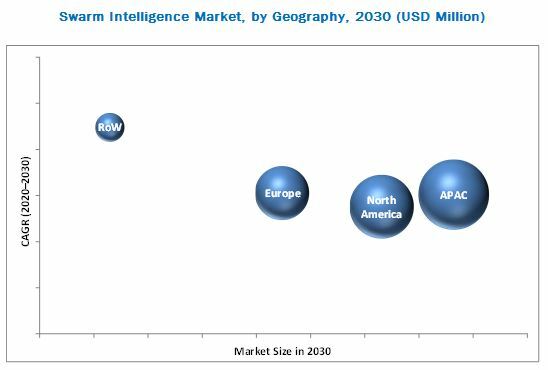 The swarm intelligence market is expected to be valued at USD 447.2 Million by 2030, growing at a CAGR of 40.47% from 2020 to 2030, considering the technology will get commercialized by 2020. The major factors driving the growth of this market include the increasing usage of swarm intelligence for solving big data problems and the rising adoption of swarm-based drones in the military. In transportation, the movement of goods along different routes increases operational costs for business, as well as lengthens the travel time. This generates the need for analytical models that can solve such problems. Ant Colony Optimization (ACO), a swarm intelligence-based algorithm, is used to solve optimization problems. This factor would further propel the growth of the swarm intelligence market in the transportation business during the forecast period. This report segments the swarm intelligence market on the basis of model, capability, application, and geography. The robotics application of swarm intelligence is expected to account for the largest market share by 2020. This is attributed to the increasing use of swarm robots in industries such as agriculture and automotive. This would drive the growth of the swarm intelligence market for robotics application in the coming years. Ant Colony Optimization is expected to account for the largest share of the swarm intelligence market by 2020. This can be attributed to the increasing adoption of this algorithm in real-time applications to provide optimal solutions. The market for Particle Swarm Optimization is expected to grow at the highest CAGR between 2020 and 2030. Optimization is expected to account for the largest share of the swarm intelligence market by 2020. Optimization is a way to solve the problem with the best combination of solutions under given constraints. These types of problems are hard to solve because of the availability of a large number of possible solutions. Swarm intelligence algorithms such as Particle Swarm Optimization and Ant Colony Optimization, and proprietary algorithms are used to find the best optimal solution among different solutions. On the basis of geography, the swarm intelligence market has been segmented into North America, Europe, APAC, and RoW. APAC is expected to account for the largest share of the overall swarm intelligence market by 2020. On the other hand, the market in RoW is expected to grow at the highest CAGR during the forecast period. The growth of the swarm intelligence market in this region is mainly attributed to increasing investments in the field of UAVs and the growing procurement of UAVs by the defense sector in Latin America. Swarm intelligence is a technology that deals with natural and artificial systems composed of many individuals that coordinate using decentralized control and self-organization. It is based on the behavioral models of social insects such as ants, bees, wasps, and termites. The technology is still in the nascent stage; as a result, there is low awareness about this technology across the globe. Moreover, players from industries such as energy and power, retail, and IT and Telecom are reluctant to accept this technology as it is unproven. The key players in this market are DoBots (Netherlands), Hydromea (Switzerland), Sentien Robotics (US), Unanimous A.I. (US), AxonAI (US), Swarm Technology (US), SSI Schäfer - Fritz Schäfer (Germany), Valutico (Austria), Enswarm (UK), and Power-Blox (Switzerland). *Details on Business Overview, Products Offered, Product Offering, Business Strategy, and Case study might not be captured in case of unlisted companies.